This is something that I like to do each Christmas Season as well. 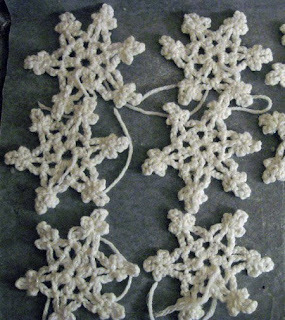 Crochet a few Christmas Stars. I learned how to do this from a website called Crochet Mania. I have the information linked below. I used a white yarn with sparkly specs in it. Joanns has it each Christmas season. My tree is usually the same thing each year since I love it. 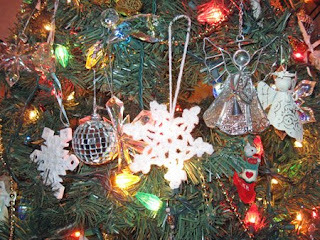 Snowflakes and Angels. I love buying these resin snowflakes from Michaels each year. Now I almost have too many. I wait until their 50% off sale and get the spikey ones for about $1 and the rounder ones for about $2.50. I hope you look up the instructions on how to make these. They are super simple once you get the hang of them. I am not a person who crochets all the time so I relearn every year. They are great to add on packages as well! Enjoy! The website where I found these great patterns is called Crochet Mania by Teresa. She has great YouTube videos in the project descriptions that go along with the instructions. Here is the link for Snowflakes I like to do each year. I add them to the tree as well as add them on packages. It is so simple but a little sticky since I use sugar. Here is what I do. I usually wait until I have about 8 snowflakes to stiffen. This amount works well for that amount. 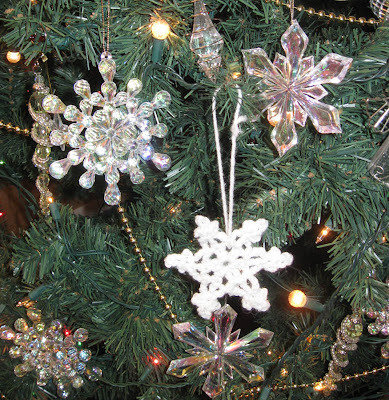 back in the day, i made a jillion snowflakes and other small crocheted ornaments for the local bazaar ... sugar starched, stretched, sprayed with glitter hair spray to preserve. lots of fun, big money. my sis still uses the ornaments i made her thirty years ago. How gorgeous! If I didn't have a million other things I want to get finished in the next 3 weeks those would be at the top of my list! But I guess I can always get a head start on next Christmas, right?